In terms of value, the global sulfur hexafluoride market is projected to expand at a CAGR of 6.3% from 2018 to 2026, according to a new research report titled ‘Sulfur hexafluoride Market – Global Industry Analysis, Value, Share, Growth, Trends, and Forecast, 2018–2026’ published by Transparency Market Research (TMR) .In terms of value, the global sulfur hexafluoride market is expected to reach US$ 340.75 Mn by 2026. The market is driven by the increase in electricity consumption across the globe. The sulfur hexafluoride market in Asia Pacific is estimated to expand at a CAGR of 6.4% during the forecast period owing to rising need for power utilities due to the increase in demand for homes and infrastructure development led by rapid increase in population in countries such as China and India. Based on grade, the technical grade segment accounted for a major share of the global sulfur hexafluoride market in 2017 and this trend is anticipated to continue during the forecast period. Based on application, the electrical transmission and distribution segment accounted for major share of the sulfur hexafluoride market, in terms of value and volume, in 2017. This can be ascribed to the wide range of applications of sulfur hexafluoride in electrical transmission and distribution devices such as circuit breakers and gas insulated switch gears. Sulfur hexafluoride has no substitutes in high voltage and medium voltage circuit breakers and gas insulated switch gears due to its high dielectric strength. Rise in electricity consumption due to growing demand from residential, commercial, and industrial sectors and increase in development activities across the globe is projected to drive the global sulfur hexafluoride market. Sulfur hexafluoride gas is utilized in leak detection applications and as a gaseous dielectric for circuit breakers, transformers, and condensers, as it possess superior performance properties such as excellent dielectric strength and thermal stability. The electricity requirement is fulfilled and transmitted through several distribution devices. Rise in installation of high voltage switchgear due to rapid industrialization is expected to boost the demand for sulfur hexafluoride during the estimated period. Sulfur hexafluoride is a key greenhouse gas with greenhouse potential (GWP) of 23500 for 100 years. Several tons of sulfur hexafluoride are released into the open atmosphere due to negligence during handling in various industries. The gas is included in the 1997 Kyoto Protocol and regulations have been implemented to regulate its emissions in the international policy. 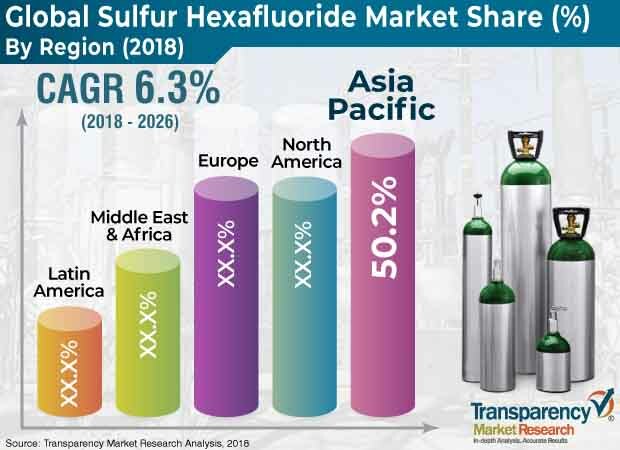 Rise in environmental concerns and regulations to control greenhouse effects are anticipated to hinder the global sulfur hexafluoride market during the forecast period. Sulfur hexafluoride is essential in electrical transmission and distribution applications due to its unique properties such as non-toxicity, chemical inertness, high thermal stability, and non-flammability. However, its high GWP increases environmental concerns about global warming. Hence, reclaiming of sulfur hexafluoride gas from electrical installations is necessary and beneficial due to economic and ecological reasons. Development of sulfur hexafluoride re-use service includes reclaiming of used sulfur hexafluoride gas and analytical services for used sulfur hexafluoride, packaging, and transport of used sulfur hexafluoride can create lucrative opportunities for sulfur hexafluoride manufacturers. Asia Pacific was the major region of the global sulfur hexafluoride market. In terms of volume and value, the region accounted for more than 40% share of the market in 2017. Initiatives by governments of developing economies such as India for affordable housing and infrastructure development are expected to drive metal manufacturing and construction industries in these countries in the near future. This factor is anticipated to boost the sulfur hexafluoride market during the forecast period. China is a major country for the sulfur hexafluoride market. Key players operate in the market in the country along with several local and unorganized manufacturers. Based on demand, China constitutes a prominent share of the sulfur hexafluoride market in Asia Pacific due to rapid urbanization leading to the rise in need for power utilities in the country and established semiconductor manufacturing industry. The report comprises profiles of major companies operating in the global sulfur hexafluoride market. Global sulfur hexafluoride market is fragmented with the presence of global and local players. Key players include operating in the global market include Solvay, AGC Chemicals, Kanto Denka Kogyo Co., Ltd., SHOWA DENKO K.K., The Linde Group, Air Products and Chemicals, Inc., Air Liquide, Axcel Gases, Fujian Shaowu Yongfei Chemical Co., Ltd, Concorde Specialty Gasesc, Shandong Ruihua Fluoride Industry Co. Ltd, and Wuxi Tianzhi Chemical Technology Co., Ltd. Market players have been profiled in terms of attributes such as company overview, financial overview, business strategies, and recent developments. The report also comprises a comparison matrix between the top players operating in the global sulfur hexafluoride market and analysis of their key strengths for 2017.